I’m from the Pacific Northwest, so I have to represent seafood on this blog every now and then! A few months ago, my husband and I bought some amazing looking salmon and a pack of cedar planks from Costco. 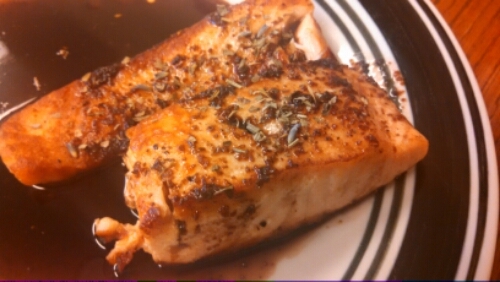 I was able to divvy up the salmon into several meals, which was a nice treat! 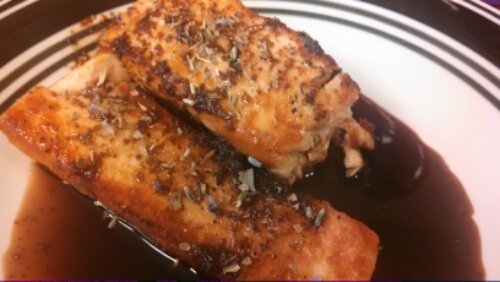 😉 This balsamic glazed salmon comes from Cooking Classy’s blog – and this is definitely a classy meal! This particular recipe did not involve one of the planks (but check out this Grilled Cedar Plank Salmon dish previously seen on this blog). I just looooove balsamic vinegar, yet I so rarely use it. I have labeled it as one of those “special” ingredients and therefore seem to save it for more “special” dishes. It can be very potent, but brings such a lovely taste and smell to any dish, that I just cannot resist it. This was a pretty simple recipe – the recipe calls for pan-frying it, but you could grill it too! Also, I apologize that I posted several pictures of basically the same thing. Lately I have not been taking many pictures of the actual cooking/prepping process, as opposed to the final product. I promise that I will get more into that! A few side notes: the original recipe calls for 4 salmon fillets, but I was only using 2, so I reduced the recipe a bit (my Ingredients list is cut in half from the original recipe’s ingredient list). Despite this, I had a TON of glaze, as you can see from the pictures, so I probably didn’t reduce the ingredients enough. The second side note is that I forgot to run to my mom’s beforehand and snip some fresh rosemary from her garden, so I used dried. But it was still tasty! 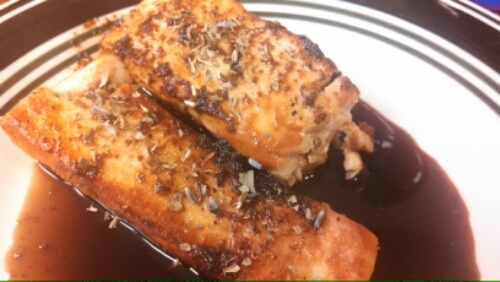 -Allow salmon to rest 10 minutes at room temperature. -Meanwhile, in a medium saucepan, combine balsamic vinegar, white wine, honey, dijon mustard, half of the chopped rosemary and the garlic. Heat mixture over medium-high heat and bring to a boil, then reduce heat and simmer over medium-low heat until sauce has thickened and reduced about 10-15 minutes, stirring occasionally. Remove from heat and pour into a heat proof dish (using a rubber spatula to get it all out) and allow to cool. -Season both sides of salmon with salt and pepper. Heat a large non-stick skillet over medium-high heat and add 1 tsp of canola oil. Once pan and oil are hot, add 2 salmon fillets and cook, without moving, until salmon has nicely browned on bottom, about 3 – 5 minutes. Carefully flip salmon to opposite side and continue to cook 3 – 5 minutes longer until bottom is browned and salmon has cooked through. -Serve warm drizzling each fillet with balsamic rosemary glaze and sprinkling tops with remaining rosemary.